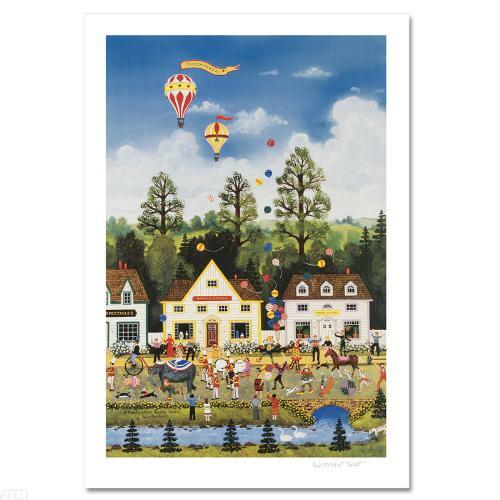 A Rambunctious Razzle Dazzle LIMITED EDITION Lithograph by Jane Wooster Scott! Numbered and Hand Signed with Certificate of Authenticity! This auction has ended without any winners. The good news? You can check out hundreds of more deals that you can Bid on or Buy-It-Now. Considered among the finest painters of Americana, Jane Wooster Scott is renowned world-wide. Most of her art traverses the experience of the United States and the American culture in which she was raised. Portraying this country quaintly and artfully, her paintings illuminate and charm their viewers. Wooster Scott does the same, perhaps equally well; glamorous and energetic, the artist is at home with celebrities who collect her art as well as the ordinary people who are the subjects of her artwork. Wooster Scott is widely collected and exhibited, with renowned actors and celebrities hosting her shows as well as purchasing her remarkable artwork. Wooster Scott counts among these Elizabeth Taylor, Paul Newman, Arnold Schwarzenegger, Marlon Brando, Charles Bronson, Steve Wynn, Merv Griffin, Sylvester Stallone, Dyan Cannon, Kirk Douglas, Carol Burnett and the late actors Henry Fonda and Gene Kelly. According to the Guinness Book of World Records, Wooster Scott is also the “Most Reproduced Artist in America.” Wooster Scott discusses the drive behind her art, saying, “It gets increasingly difficult to find the United States as I imagine it was a century ago–the barns, stables, cottages and town halls. Water pumps and windmills, covered bridges and one-room school houses are disappearing. But I intend to continue to seek out the remaining treasures of our heritage and paint them for my own joy and for people who share my love of country. Bid price is per item. 2) 15-day money back guarantee applies to items which are not as described upon receipt. This includes items which are materially different from the auction listing and/or are damaged upon delivery. Items which are found to be as described or non-damaged will be subject to a 15% restocking fee, and the shipping and handling charges and transaction fees will not be refundable. Damaged items or personal preference returns must be made within the 15-day period. 3) If you must cancel an order prior to shipment, the order is handled as a return and you will be assessed a 15% re-stocking fee. Excessive cancellation may result in the revocation of bidding privileges. Shipping & Handling: $15 within the contiguous United States. If shipping to Alaska, Hawaii, Puerto Rico, or Canada $40 additional.